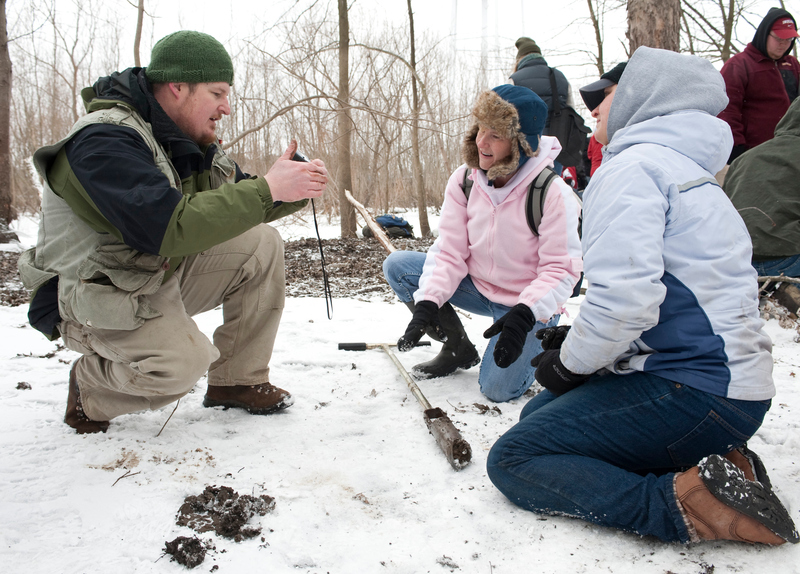 As the group of about 30 Indiana State University students trekked through the Wabash River bottoms on a recent cold and snowy Saturday morning, Jim Speer, associate professor of geography and geology, gave a warning. "There are definitely a lot of frozen wet areas out here and we don't want you going through the ice," he said. Students bundled against the cold to measure trees, look for wildlife and take soil samples as part of field work for the classes in soil genesis and classification and conservation and natural resources as they wandered through Wabashiki State Fish and Wildlife Area, which also is the newest Vigo County park near West Terre Haute. The park stretches from the Wabash River to U.S. 40 to Interstate 70. 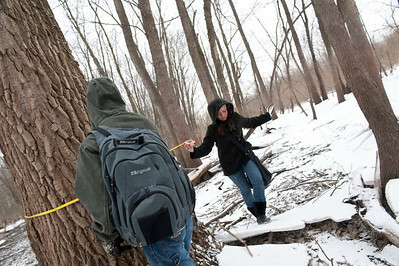 On that recent Saturday, snow and ice covered the river bottom, where students began their work. "Whoever said fat broads were warm lied," said Laurie-Ann Curry, senior anthropology major from Freedom, with a laugh. "They lied like a dog under a porch." Yet, she said, she enjoyed her day looking for wildlife. "Working with Dr. Speer is like it's the best Montessori class in the whole planet for big kids," she said, explaining how she liked the freedom of research. Windy McBride, graduate student in geology from Terre Haute, agreed. "When I got up this morning, I thought, ‘Ohhh, it's going to be a bad day to be out in the field,'" she said. "Once you get out here and start moving around and you're learning, you forget how cold it is." For Speer, the cold only adds to the real world experience for his students and makes the lessons more memorable. "I can tell you, them sitting in my classroom taking notes from my lecture tends to disappear from their memory," he said. "But they tend to remember when its 24 degrees out with a 16 degree wind chill, the ground is frozen and they're playing in the mud." McBride and four other students bored through ice to the soil below to take a sample. They then spread it out on the ice-covered ground to inspect and describe it. "There's a lot of information that can be known about a particular environment just by looking at the soils," she said. By checking the color, McBride said it tells what makes up the soil and its organic matter. "It also tells its permeability, how much water leaches through," added Ryan Hendricks, an ISU graduate student in geology. In Indiana State's science labs the students will run tests to see what pollutants may also permeate the ground. That information gathered and researched by the students then gets sent to county officials. "It's a county park just started about five years ago and they really haven't completely explored the area," Speer said. "They're just figuring out what wildlife is out here, what the soils are like, what the different characteristics are." Such a project fits in with a new endeavor at Indiana State called Science Education for New Civic Engagements and Responsibilities (SENCER). It's "applying the science of learning to the learning of science," Speer said, in an effort to make science meaningful to students by getting them involved with it. The program also encourages students to engage with the community. "We're helping out the county parks department in this particular case," he said. That combination of hands-on experience and community involvement does impact students. "The SENCER classes, hands-on has totally changed my university experience," Curry said. "My grades have improved. The best thing is I got it. I got it because I actually got to get my hands dirty and use the tools that you actually use when you're done with this and it's a real world thing." Research at park fits in with a new endeavor at Indiana State called Science Education for New Civic Engagements and Responsibilities (SENCER).